MUNICH -- German investigators will continue their probe into former Volkswagen Group CEO Martin Winterkorn's role in the automaker's diesel scandal even after the U.S. Justice Department filed criminal charges accusing him of conspiring to cover up the company's emissions test cheating. Winterkorn is the highest-ranking person to be charged in the three-year investigation, opening a new chapter in the scandal that burst into the open in 2015 when VW admitted to rigging the emissions setups of some 11 million vehicles worldwide. "Our investigation strategy does not change just because the Americans have filed charges against Winterkorn," a spokesman for the prosecutors' office in Brunswick in VW's home state of Lower Saxony said on Friday. German authorities have conducted several raids at VW Group sites. The U.S. indictment of Winterkorn, filed in secret in March, was unsealed in U.S. District Court on Thursday as Volkswagen held its annual meeting in Germany. U.S. Attorney General Jeff Sessions said: "If you try to deceive the United States, then you will pay a heavy price." Sessions said in a statement that the charges against Winterkorn showed that "Volkswagen's scheme to cheat its legal requirements went all the way to the top of the company." 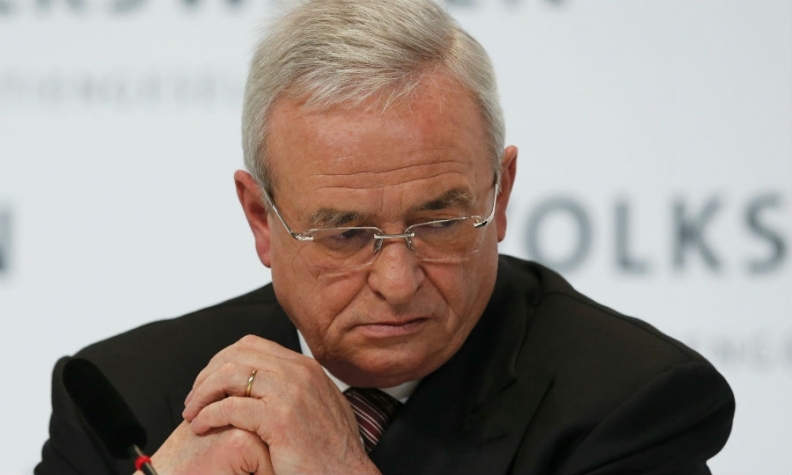 The U.S. indictment of Winterkorn is likely to be largely symbolic. He is unlikely to face trial in the U.S. because Germany doesn’t extradite its citizens to countries outside the European Union so Winterkorn won’t be arrested unless he leaves the country. A source close to Winterkorn told Reuters on Friday that Winterkorn is in Germany, and will remain there. Winterkorn, 70, is charged with four felony counts, including conspiracy to defraud the United States, wire fraud and violating the Clean Air Act from at least May 2006 through November 2015 after the company admitted using illicit software that allowed Volkswagen diesel vehicles to emit excess pollution without detection. The indictment describes a July 27, 2015 meeting at which VW employees presented PowerPoint slides to Winterkorn and "other senior VW management at an in-person meeting at VW's headquarters in Wolfsburg." The meeting provided a "clear picture" of how the company was deceiving U.S. regulators about software used to rig emissions tests of Volkswagen diesel vehicles, it said. The indictment also states that Winterkorn was informed of the emissions cheating by a memo sent in May 2014. Winterkorn has said he did not learn of the cheating until late August 2015. VW had initially suggested that only lower-level executives knew of the diesel emissions cheating. In total, nine people have been charged and two former VW executives have pleaded guilty in the case and been sentenced to prison terms in the U.S. One Italian citizen, former Audi manager Giovanni Pamio, is in Germany awaiting extradition. VW settled criminal charges with the U.S. Justice Department in 2017 and agreed to a $4.3 billion payment. In total, VW has agreed to spend more than $25 billion in the United States to address claims from owners, environmental regulators, states and dealers. At VW's annual meeting in Berlin on Thursday, VW's new CEO, Herbert Diess, promised to make the carmaker "more honest" as it fights to recover from the scandal. After Winterkorn indictment, who else is under investigation?